I , ______________ a retired employee of _____ (Office Address) ___________ declare that I am residing at _______________ (Residential Address indicated in PPO) ________________, which area is not covered under CGHS or any corresponding Health Scheme administered by the Ministry/Department of , _________________________ (as the case may be). I have also not obtained and do not wish to obtain a CGHS Card for availing out-door facilities under CGHS/Corresponding Health Scheme of other Ministries/Departments from any dispensary situated in an adjoining area. 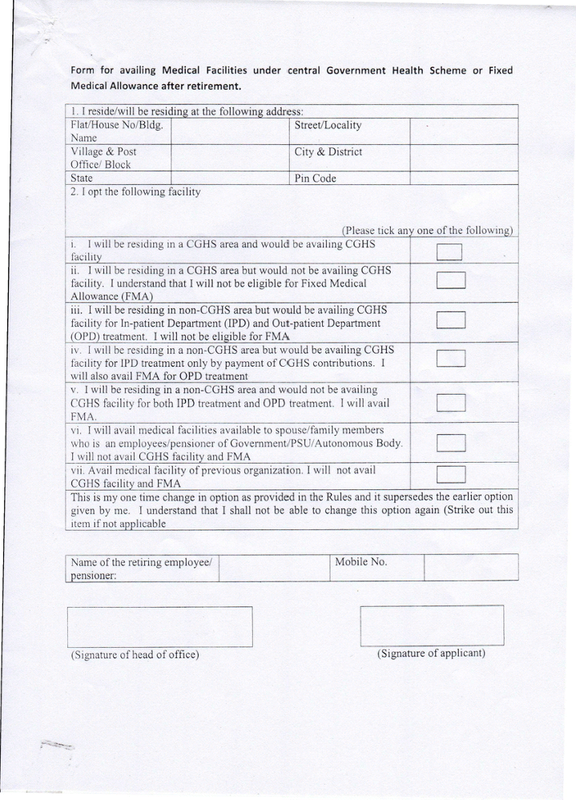 Click to view/download: Form for availing Medical Facilities under CGHS or Fixed Medical Allowance after retirement.